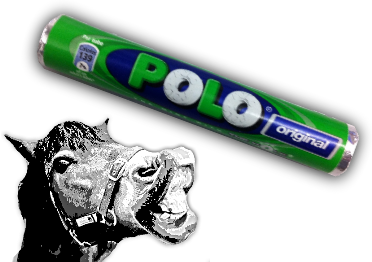 Polo "the mint with a hole" is one of Britain's favourite candies. Introduced by Rowntree of York in 1948 (now part of the Nestle family) Polo Mints have remained one of the best sellers in the UK and in every corner of the world where fans of traditional British candies can be found. Horses also love Polo Mints. Perhaps they are attracted by the delicious peppermint aroma. The Duchess of Cornwall regularly feeds Polo Mints to her horses. Since Blighty's is located close to a lot of horse farms we often meet customers who are buying up handfuls of Polo Mints for their "Polo ponies". When we break the seal on a fresh case of Polo Mints here at the store the minty fresh aroma spreads all around the shop. Keep a pack in your pocket for their refreshing minty flavour - and for when you meet a horse! Blighty's price $1.29 per tube.